I've recently finished reading The DevOps Handbook, and Thinking in Systems, and have just started reading The Fifth Discipline. Below are a few of my thoughts after reading them. The first way focuses on getting software through the work stream, the second way focuses on getting feedback, and the third way focuses on organization learning. 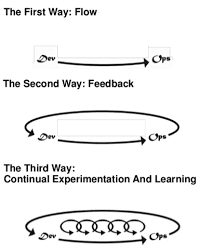 The DevOps Handbook's visualization of the 3 ways reminds me of systems diagrams in Thinking in Systems by Donella Meadows. After reading The DevOps Handbook and Thinking in Systems, I got curious about systems thinking, and how that applies to software development, and more broadly how it applies to business. 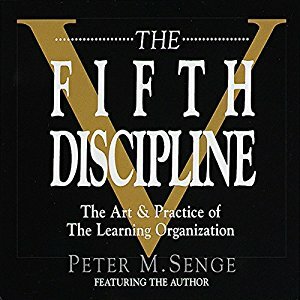 I did a bit of research, and found The Fifth Discipline by Peter Senge. So of course I ordered a copy. I'm only halfway through, but it seems to me The DevOps Handbook is the application of The Fifth Discipline to software development. Mental Models - Mental models are deeply ingrained assumptions, generalizations, or even pictures of images that influence how we understand the world and how we take action. Building Shared Vision - Building shared vision - a practice of unearthing shared pictures of the future that foster genuine commitment and enrollment rather than compliance. Team Learning - Team learning starts with dialogue, the capacity of members of a team to suspend assumptions and enter into genuine thinking together. Systems Thinking - The Fifth Discipline that integrates the other four. All participants must "suspend" their assumptions, literally to hold them "as if suspended before us"
In my experience, being able to put ideas out there to be examined without the conversation eroding into attacks / defensiveness is very difficult. Maybe the ability to do this is what makes a great team. The Fifth Discipline might be one of the best business books I have ever read. It ties together lean manufacturing concepts with systems thinking. 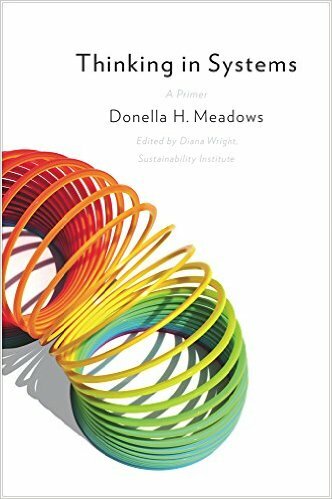 I'm adding Systems Thinking to my ever growing list of topics to study. It seems to me that the learning organization lies at the heart of truly successful software companies, and DevOps practices as laid out the the DevOps Handbook foster the kind of learning necessary for success. This isn't anarchy it's quite the opposite. When you start to follow Holacracy, you learn to create new structures and ways of making decisions that empower the people who know the most about the work you do: your frontline colleagues. Reinventing Organizations: A Guide to Creating Organizations Inspired by the Next Stage of Human Consciousness by Frederic Laloux. Both Holacracy and Reinventing Organizations are about designing organizations to tap into the potential of the people, to bring humanity and compassion to the workplace. Companies organized in this way are referred to as Teal Organizations. Is this not another application of systems thinking?